What Can I Visit In Versilia (Tuscany) 2018 In Summer? 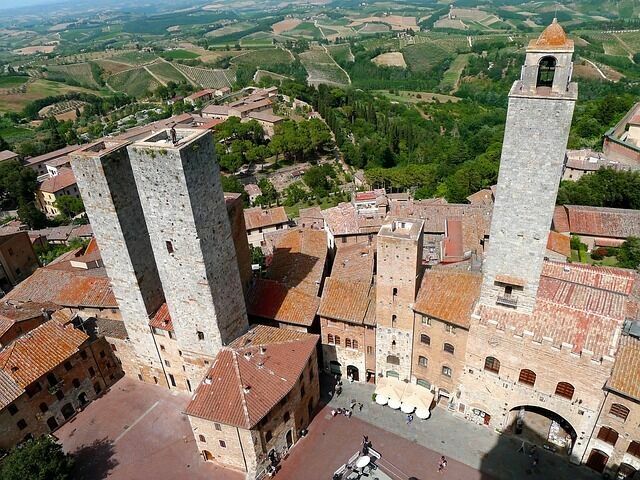 One of the best experiences in San Gimignano is to admire the amazing landscape from its tallest tower. 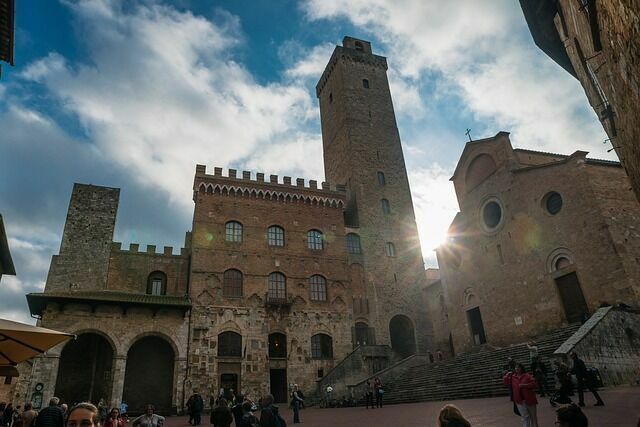 By heading to Piazza Duomo and into Palazzo Comunale you will have the chance to climb to the top of Torre Grossa, which literally means “big tower” in Italian. All of the towers in San Gimignano were and remain privately owned and closed to the public except for this one, which continues to be part of city hall. The city's tallest tower standing tall at 54 meters. With no elevator, be prepared to climb up 218 steps slowly and carefully. The view at the very top is worth the effort. Many towers have interesting names and histories attached to them. The “Torre Rognosa” or “troublesome tower” was used as a prison, so its name comes from the fact that those that ended up there had had “troubles” with the law. The Twin Towers found in Piazza delle Erbe, on the other hand, were built to get around the height limit set by the city, as their heights summed up together exceeded those of their rivals. The tower called “of the devil” has inspired several legends, including one that says that the owner upon his return from a trip found the tower taller than it was before, and that this unexplained and mysterious growth was due to the devil’s work. An other place to visit is the interior of the Duomo of San Gimignano, also called the Collegiata di San Gimignano. The treasures inside include many frescoes. The colors you see are the original ones painted in the 1300s and their vividness and brightness is awe-inspiring. Entrance into the Duomo does have a cost but it includes a free and easy to use audio guide that will make your visit and viewing of all of the frescoes much more enjoyable. 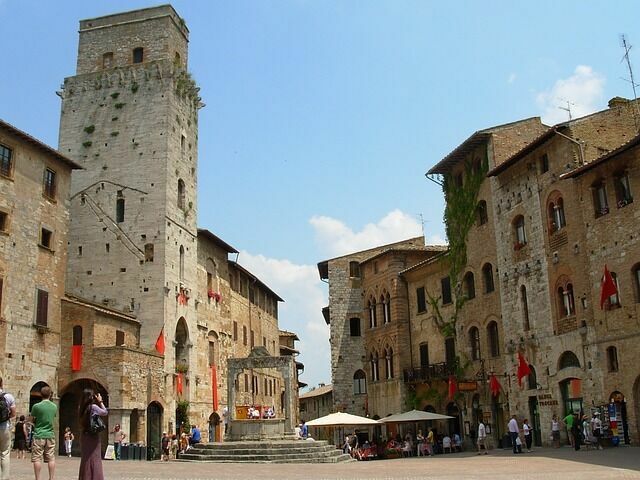 You have also the possibility to visit the museum complex of San Gimignano. On the first floor of the museum there is a reconstruction of Santa Fina's spezieria or pharmacy. Right before this there is a small room with a collection of beautifully decorated plates and ceramics. The reconstruction of the ancient pharmacy divides the space as they were back then, into an area where they were made (workshop) and another where they were sold (counters). The layout showcases the collection of pharmacy vessels from the 15th and 18th centuries and glass containers from the 16th-18th centuries from the “spezieria” of the local hospital founded in 1253. In medieval Florence, the term spezieria was used for the guild of physicians and pharmacists, one of the city's seven major guilds. Also on this floor is the Archaeological museum which has several rooms showing many of the Etruscan and Roman sites and finds in the area, from funerary urns to ceramics and metal mirrors. Another section is dedicated to the Middle Ages, with evidence showing its production of glass and ceramics dated to that time. Interesting panels highlight the story of the growth of the city. On the second floor, you'll find the Gallery of Modern and Contemporary Art “Raffaele De Grada” where you'll also find any temporary exhibitions. 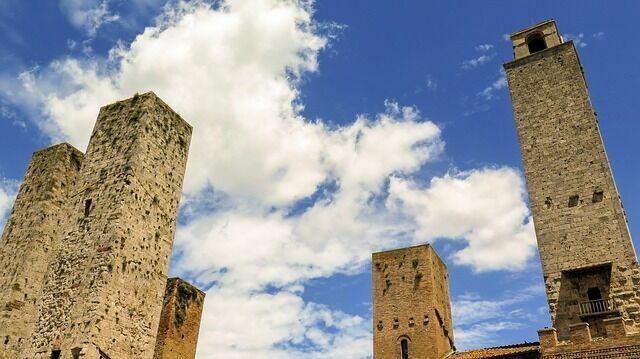 If you have more time to spend in San Gimignano, you can also explore the fascinating “San Gimignano 1300 museum” which has recreated in small scale in clay the entire city of San Gimignano. It shows how the town looked like in 1300 with all of its towers, many which no longer stand, and how they looked back then with their wooden balconies. The towers belonged to the many noble and wealthy families that lived within the city. They were, first of all, a system of defense from enemies, including rival families living within the same town. The structure itself makes it an almost impregnable fortress: entrance was several feet above ground and accessible only with retractable ladders, the thick and high stone walls were hard to scale and difficult to give fire to. The miniature city shows the towers with its wood balconies and platforms that were integral part of the towers and which permitted passage from one level to another within the tower. 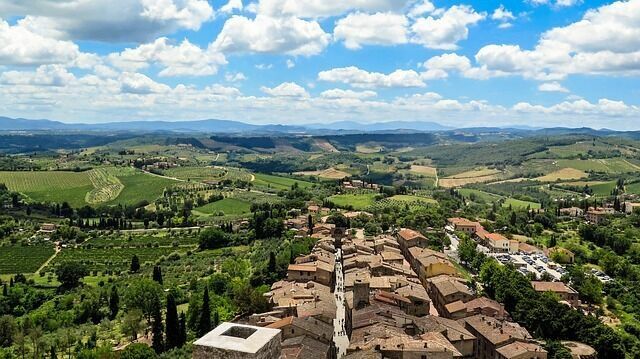 You can also climb to the top of the town to visit the remains of the old fortress, the Rocca di Montestaffoli and visit the small museum dedicated to San Gimignano local white wine, la Vernaccia di San Gimignano. Another attraction is the Torture Museum which has instruments of torture, not for the light of heart. If you want to enjoy a stay in this wonderful city, then take a look on our Holiday Homes in San Gimignano - Tuscany.